In 1963, Corporals Bill “Charlie” Bascom, Dan Carbaugh, Gary Zehnder and Doug Brane were all stationed together at New River as radio repair technicians. After their active duty all returned to college after which Bill became an English teacher in Missouri; Dan became a technical representative for Westinghouse and lived all over the world; Doug was in the water purification business in Florida; and Gary worked for a number of airlines including United, Republic and Northwest and lived in Minnesota. 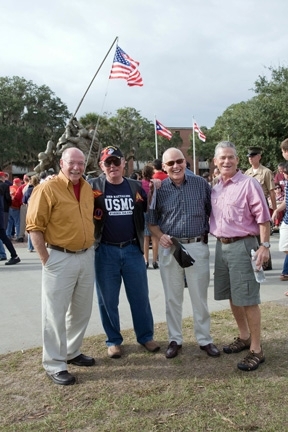 In October of this year (2009), they got together again for the first time in 45 years in Beaufort, where they attended a moving graduation ceremony of 474 new Marines at Parris Island and spent a few days telling lies and even a few true stories about their experiences in the Corps and since.When Bill’s wife asked him who had changed the most since they had last met, he said that no one had really changed much. When he last saw his friends in 1963, all the parts were there, but now 45 years later, the parts had been completely assembled, and they were still a great bunch of guys. Our reunion generated a lot of interest within my own family and among Melanie’s and my friends before we came to South Carolina, and the curiosity has continued in the days since we came home. On my early morning walks I have been thinking a lot about the significance of our special reunion, and I will continue to do so for a long time. I wonder if you guys have thought about any of the same things. Doug’s picking up stakes with Jane and heading to Australia in search of a future and then returning to Florida to go into business with his dad and developing some kind of water purification technology and the injection molded hardware which was manufactured in China and sold all over the world. I think Doug might have been a CPA for a while too before we decided enough was enough. Dan, who was clearly the best technician of us all, not surprisingly became a technical representative for Westinghouse (and others?). He lived all over the world and learned to speak at least four or five languages. He is a virtual encyclopedia of film facts, and his knowledge of American films could easily earn him a zillion bucks on Jeopardy. We owe him for the recon on the PI Graduation dates and finding the accommodations at the MCAS Beaufort. Graduation was one of the real highlights of the trip. Gary, who was always charismatic and dependable (maybe that happens when you have so many brothers and sisters to keep you in line) still has an amazing memory. His career with the airline industry in some kind of financial and negotiating position came as no surprise. His hobby was always politics, and in his retirement he still volunteers in some capacity for an employee credit union in Minnesota. I am pretty certain they had a very hard time letting him retire, and the conference call he had to make on Thursday night before graduation was probably to bail someone out or to put someone back on the right path. I hope if we meet again, he can use those negotiating skills to convince Karen to come along too. We all seem to agree that we were extraordinarily lucky to have been in the Marine Corps when we were and to have survived the experience before Nam. It was pretty amazing that our friendships which began more than 45 years ago were strong enough to take the risk of having a blind reunion with our wives. In spite of misgivings, I think the wives had almost as much fun as we did. I know Melanie did, and she would love to do it again.